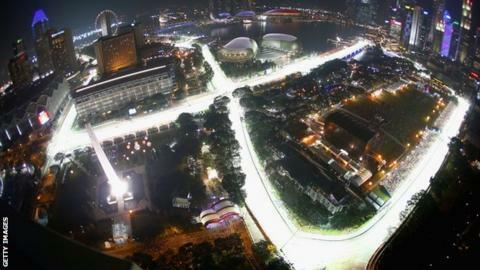 Singapore will continue to host a grand prix until at least 2017 after striking a deal over a new contract. Singapore senior minister for trade, industry and education S Iswaran said the race's costs would be reduced, partly through a "revised" fee. F1 boss Bernie Ecclestone said: "We're very happy with what we've got in Singapore. "All of us without exception like being here and that made it difficult to negotiate. We eventually got there." The south-east Asian city state's first contract was due to expire after this year's event - although the race was guaranteed for the next two years through a clause that dictated it had to be held in 2013 and 2014 if organisers wanted to pull out. The glamorous location and night-time sky-line mean Singapore has established itself as one of the sport's most valuable races. In its brief five-year existence it has already come to rival Monaco in terms of commercial impact. Race organisers admitted they were considering revising the circuit. The 3.15-mile Marina Bay track is one of F1's toughest tests but there have been concerns that it impinges too much on the daily life of the city. Iswaran said: "As of now, we are looking at the options. The current track has served us well. We continue to see if there are any opportunities to vary or modify it but at this stage there are no specific plans to do so."